The effort to protect threatened and endangered species calls for deep pockets. In 2013 alone, U.S. federal and state governments spent more than $1.7 billion toward the conservation of species at risk, according to a report from the U.S. Fish & Wildlife Service. With such massive investments at stake, scientists are looking for better ways to get federal agencies and states the information they need to make informed conservation decisions. Working with an international team of researchers, scientists from the University of Maryland and the National Socio-Environmental Synthesis Center (SESYNC) have co-developed an in-depth database of nearly 600 plant species worldwide, including the threatened and endangered Pitcher's thistle, scrub mint, Lakeside daisy, Godfrey's butterwort, and Spalding's catchfly. 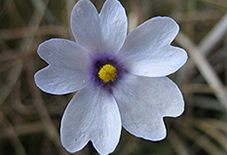 Named the COMPADRE Plant Matrix Database, it is currently the world's largest open-access source of demographic information for endangered, native, and introduced plant species. A scientific paper based on the database was published online in the Journal of Ecology. The database co-developers and paper co-authors include Maile Neel, UMD associate professor within the College of Agriculture & Natural Resources and College of Computer, Mathematical, and Natural Sciences; Judy Che-Castaldo, SESYNC postdoctoral fellow; and Tara Ruoff, UMD student. COMPADRE compiles data from 468 studies conducted around the world. It includes survival and reproduction rates on every stage of a plant's lifecycle, geographic location, and other fundamental demographic information. The comprehensive and open-access repository will enable database users to make comparisons across populations, species, and regions to answer questions at global scales. "To be able to pull this information out of a single database, and in a form ready to be analyzed in seconds, is a huge benefit," said Neel. "It's taken dozens of researchers a quarter century to find, compile, digitize, and error-check these data. Having this volume of information at our fingertips will help us address questions we simply haven't been able to answer yet." Having access to these plentiful and rich data will also make it easier for decision makers to cost-effectively address important questions about plant management and conservation. "Managers may not have the data they need to determine a plant's extinction risk or what type of conservation action is needed," said Che-Castaldo. "And to go out into the field and collect those data themselves would require time, money, or access they may not have. But if the plant is similar to a species in the COMPADRE database, then we can use that information as a starting point to infer what kinds of strategies might be most successful." The first iteration of COMPADRE was created by Jonathan Silvertown and Miguel Franco 25 years ago. The database launched today—a collaborative effort amongst researchers representing 26 institutions worldwide—is a significant expansion of both content and accessibility on COMPADRE 1.0. Neel, Che-Castaldo, Ruoff, and former UMD student Liliana Orellana themselves contributed data on 217 species from 148 studies and an estimated 1,000 hours to the project. The database is available online at: http://www.compadre-db.org/. The National Socio-Environmental Synthesis Center, funded through an award to the University of Maryland from the National Science Foundation, is a research center dedicated to solving complex problems at the intersection of human and ecological systems.